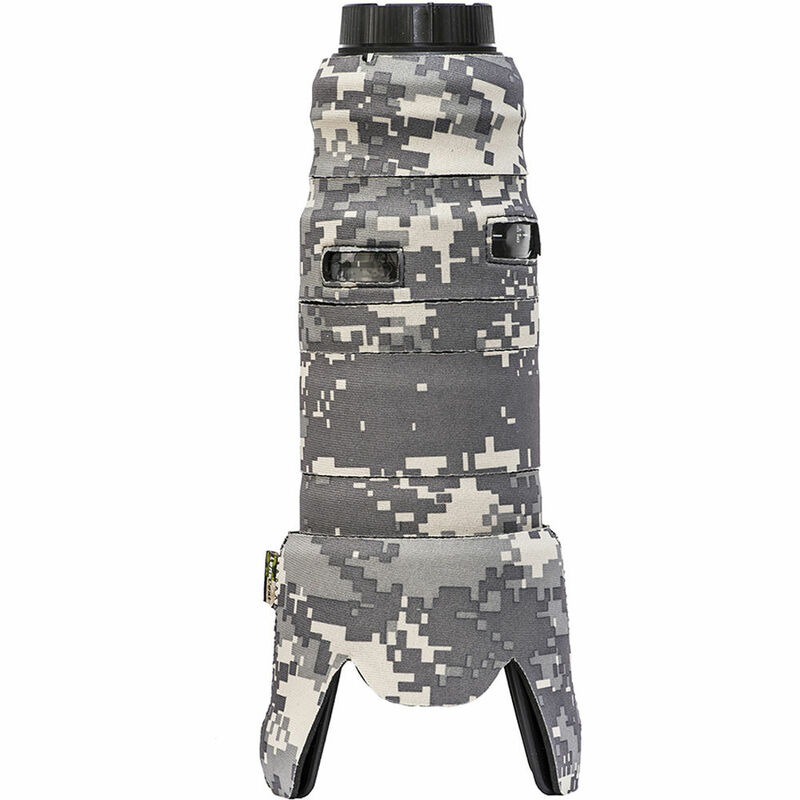 The Digital Camo LensCoat for the Tamron SP 70-200mm f/2.8 Di VC Lens wraps the lens in a 100% closed-cell waterproof neoprene jacket, offering protection from wet weather, bumps, jars and nicks. This coat allows your lens to blend in with your surroundings, making it a valuable accessory for nature and outdoor photographers and helping to camouflage your lens from wildlife. It is also useful for sports shooters and photojournalists who are regularly subjected to less than optimal shooting and climate conditions. It has a clear plastic window over the distance scale. The LensCoat Lens Cover also provides a thermal barrier, protecting your hands from cold lens surfaces in lower temperatures. It is easy to install and remove, leaving no residue on the lens. Because of the increased protection this covering provides, it can help preserve the resale value of your lens. Digital camo is an advanced computer generated pixelated camouflage pattern that maximizes visual break up. Featuring small rectangles of color, it mimics naturally occurring dappled textures and rough boundaries. Box Dimensions (LxWxH) 8.5 x 5.3 x 1.3"
LensCoat for the Tamron SP 70-200mm f/2.8 Di VC Lens (Digital Camo) is rated 4.0 out of 5 by 4. Rated 3 out of 5 by Jay from OK product Pros: (1) Made in USA. (2) Quality material. Cons: (1) The cuts of the pieces are mediocre. The alignments are always a little off. Sometimes the the lens surface is not totally covered up (e.g., the hood piece). The piece on the focus scale window and the piece on the focus ring are too close, and that causes either the focus ring is too tight to turn or the window is partially covered up. (2) The installation instruction is not adequate. (3) It may be my fault, but I can't get the texture to align between pieces. Rated 4 out of 5 by paintcheckphoto from Good but... Good product, covers everything fairly well but two complaints: 1) no instructions or clear guide to indicate which piece goes where. Some of them are obviously but others are not so much. 2) some of the pieces are cut either too big or too small for the sections they are meant to cover. This is more of an annoyance for me more than anything, but combined with the other item above, docked 1 star. This is my second lenscoat product. I just wish they made it for other tamron lens'! Rated 4 out of 5 by Sparky from 1st time buyer It will keep the scratches off. The camo pattern doesn't line up very good. Unfortunately no, that lenscoat is only designed to fit the one Tamron lens. Because of the placement of the buttons, switches, seams, and size of the lenscoat pieces it would not properly fit any other lens. Is this a one piece cover, or a multi piece cover? Will it allow zoom and manual focus without interference? This cover is multi-piece. It will allow zoom and manual focus without interference. does it fit with the lens hood reversed?